The Hawes had a printing business in London from the 1860s, started by David’s great-grandfather, who came from this part of Suffolk; he went with his father to London in the 1860s and was indentured in 1864. He established a business off Cleveland Road in the East End, in or before 1880. When he and his son moved to the Lion Inn in Elmswell in about 1906 they installed some printing machinery in outbuildings there. Not long after great-grandfather died (maybe 1912), grandfather bought a house in Cooks Road, moving the machinery into a wooden building on the site. This was a 32’×16’ two-storey clapboard building typical of the area, built as an apple store by Alan Fayers, and it lasted over 90 years. [Click to enlarge] In 1923 the firm purchased a Furnival letterpress machine which remained in use until the late 1970s, printing auctioneers’ posters. Grandfather was not strong in business acumen, and it was grandmother who provided the determination to keep the show on the road. During the war it turned over only about £300/year, though admittedly the shortage of paper would have been a contributing factor. They ran this small business (with only one or two employees) until he broke his ankle in 1944 and was unable to continue [perhaps it gave him an excuse not to continue?]. Then David’s father took over the firm, which by then no longer had any staff and the business was in a very run down state. A 14-year-old apprentice [Ron Bull] was taken on but had to go back to school because the school-leaving age had been put up to 15 that year. A Mr Handscomb was recruited as part-time compositor [like lots of the older compositors at that time, he took snuff]. Then another compositor was employed, a bad-tempered fellow named Aubrey Bluett, who travelled each day from Bury by train; he was rather fond of his beer. In 1948 there were about 3 or 4 full-time staff, including a deaf and dumb lady, a Miss Farr, who did binding work. The firm’s finances had improved, but although there were plenty of orders the supply of paper was still severely restricted. Hawes and his son David would go round the paper merchants in the Port of London and try, often unsuccessfully, to scavenge supplies of paper. To some extent the firm was kept going by the labels business from ICI in Stowmarket: they had to overprint large numbers of them with colour and batch no. David remembers spending many hours as a 7 year-old feeding these labels in by hand. He also became a compositor from about age 7, standing on a box to reach the cases to get letters out. And after each job he had to beak down and put the letters back (‘distribution’). 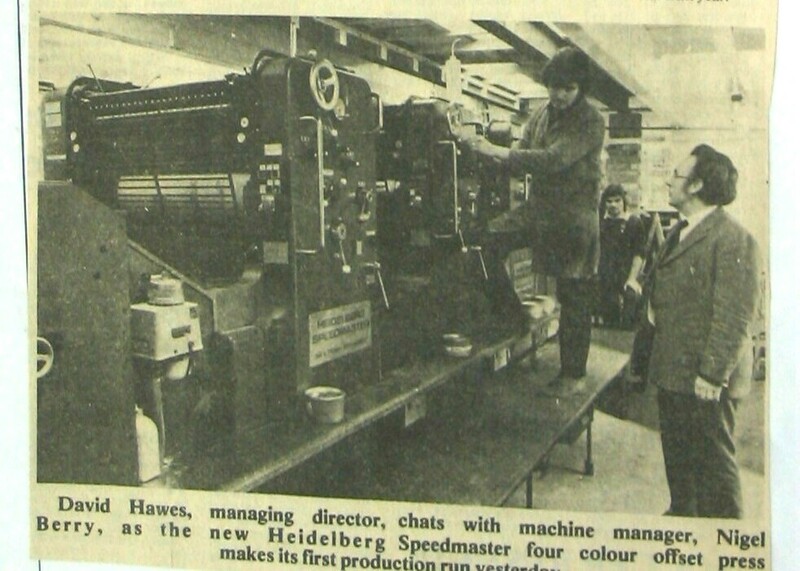 By the mid 1950s things were better and Hawes purchased a second-hand Heidelberg Super speed Platen (it was virually impossible to find new equipment). This fed the paper into the printing machine automatically, speeding output from 900 copies per hour to about 3,000. Over the following years more machines were added, and staff increased to 12-15 by the end of the decade. While most of the men were local, shortage of skilled craftsmen in the printing industry made it necessary to recruit staff from further afield (Bury, Diss) and to train apprentices as compositors and machine minders. However there followed rapid technological changes in the printing industry: for example, the old letterpress system (slower because using reciprocating motion) was gradually replaced by offset litho (rotary, so many times faster) which was less labour intensive. 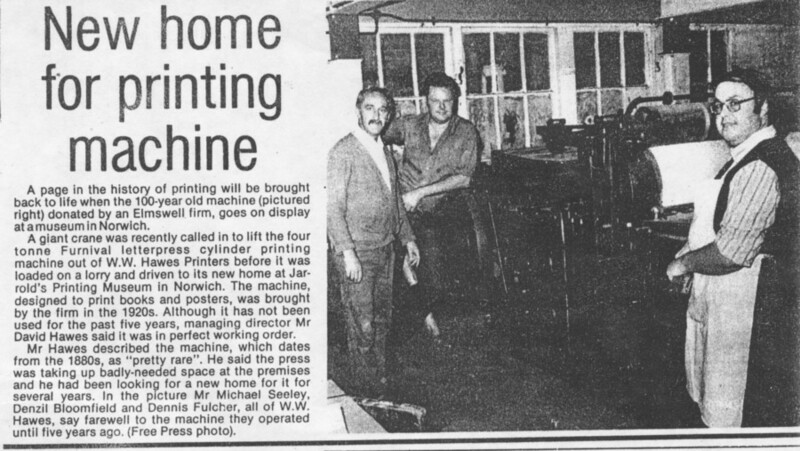 In early 1979 the firm, keen to take advantage of Common Market membership and secure orders from abroad, invested £125,000 in a Heidelberg Speedmaster, a four-colour offset press which was able to print full-colour leaflets, brochures etc. The output included much advertising material but also books and pamphlets for English Heritage and other restoration organisations; the books Lost houses of Wales and Lost houses of Scotland were in demand even after the firm ceased trading years later. The introduction of computers, scanners and photo-composition also increased efficiency; the result was a decline in staff to about 25 over the 10 years to 1985. But as computers and peripherals became widely available there emerged the concept of ‘desk-top publishing’, removing from the traditional printing industry much of the artwork creation and small-run printing jobs. Though Dunelm still stands, the printing works were demolished and the land sold for housing development, now known as Whatley Close. George Russell: W W Hawes’ firm, now of Cooks Road, was started at the Lion Public House in Ashfield Road. Ray Eyres: Grandfather Hawes we used to supply him with electricity for the presses at the time – they had foot-treadle machines mostly. Jim took over, father of David – the last one that had the firm. Fred Buckle: When I went to work at Hawes printing in Cooks Road, it was only a wooden building. Walter had 2 men Ray Porter, & chap from Woolpit; I was the dogsbody at 7/6d. a week. They printed the monthly church magazine, which I delivered by bike to all the surrounding rectories, miles; I wasn’t keen, being 15 or so.